For years the list of people who I wanted to interview was headed by Pierre Henry. Together with Pierre Schaeffer, Henry was one of the founding fathers of musique concrète. He was especially interesting to me because after an initial close relationship with the "official teachings" of musique concrète Henry chose his own path. Having left the Groupe de Recherches Musicales (G.R.M. ), Henry successfully set up his own studio and pursued his own career. His latest release is L'Homme a le Camera, based on the film by Dziga Vertov with the same title. For this interview the questions were faxed to M. Henry. For his answers he set up a little sketch, his assistant assuming the role of interviewer. This fake interview was recorded and the tape returned. After your musical training you started to investigate the nature of sounds. When was that and why? Why did I suddenly want to start to work with a new musical universe? This was at practically the end of my formal musical studies. I have said it many times and I will tell it again now: I started to listen to the world around me, outside and in my parents' garden, inside the house where I had started my musical studies at the piano and vocal scales. Well, all of it must have been due to my fondness for noises. I had started my career as a percussionist quite early, beating on anything around me; furniture, the tables, the drums. 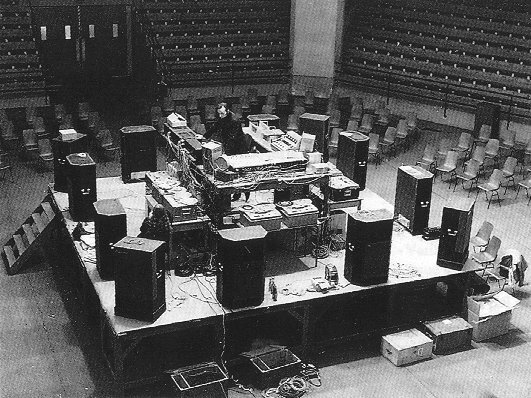 I arrived at the moment of creating a noise, and went on to create something entirely new, an unheard sound that was much more complex and extraordinary. At the beginning I wanted very much to create something strange. Henry loved the theatrical presentation of music, admiring Wagner for example. He also became an ardent admirer of the ballet of Maurice Bejart. With Bejart's group Henry travelled the world as sound engineer. He also composed many works for ballet. La Messe Pour Le Temps Present became a very popular piece of music that was scored for ballet. He expressed this fondness for dramatic theatre in compositions, staged in large halls, that had the atmosphere of (pagan?) masses, lasting at least three hours without a break. In the 60s you worked with the rock group Spooky Tooth on Ceremony. Why was that? The reason for this was much more commercial than artistic. The great success of La Messe Pour Le Temps Present and Les Jerks Electroniques with Michel Colombier gave my editor at Philips the idea that I should work together with an English group to make a thematic album, based on the idea of the Mass. When this started, I didn't know these people at all, and I accepted for a number of reasons which would not interest me now, but to me this enterprise was totally without any result for years. I am planning a new work with a rock group, but I can't say anything about that now. Henry went to London to supervise the recordings. He brought the tapes home and began the editing process. "He didn't like the heavy basses and the voice drowned in reverb, so he composed a sort of counterpart Ceremony II. This work is a myriad of little additional movements based on concrete sounds, beaten tam-tams, carillons, forming little pagan rites for an imaginary savage religion." (Michel Chion). Perhaps that shows how Henry looks at pop music; a pagan ritual. Were you interested in the popular side of electronic music? To me that is not a big deal, because my music has never been truly electronic. It's music for tape, an electro-acoustic music. It leaves me a bit cold. A creator does not search for immediate success. But do you look around you at what happens with electronics in popular music? Well, actually, I don't have the time to have a pressing curiosity in that area. I hold tight to my own formulae and my system. Moreover, I think this music becomes more and more polluted ... this music is absolutely disgraceful on the radio, at the cinema, in adverts. And I see that at the moment there is one sound. Not sounds. One single sound, everywhere. It's a sound that has been standardised. It's a sound that is produced digitally, and it all comes down to the same sound, which is a painful thing at this end of the century. What was the effect on you, when you scored a number 1 hit single in the French charts? But I haven't been number one in the hit parade! That is a big misunderstanding! The record was released in a category of classical music, and I was judged by the standards of classical music, not of pop or rock music. In the same list, 2nd and 3rd, were the Concerto de Aranjuez, The Four Seasons, Albinoni. So, all in all, the young people were right to buy La Messe Pour Le Temps Present and Le Voyage, La Porte Et Un Soupir. But it was a list of classical music. You did attract large audiences at your live concerts. Did you feel like a rock star? I have met with the appreciation of a large public that was interested in my concerts. I believe that everywhere where I have performed interpretations of my work, I received an immediate response from the audience. Whereas, with the release of records, the reactions of the audience are quite remote. Now it is more interesting for the audience, because the records are copied, and less interesting for the composer. But overall, the music gets everywhere which is basically a good thing. But don't forget that as well as discs, there is also radio. I have renewed my acquaintance with the radio waves recently. I think it must have been an awkward experience to suddenly see masses of people crazed over your music. I was not very much embarrassed by this because I was always occupied by my music. And by its continuity. Could one say that your reputation from the 70s is what has brought you into the Mantra label's catalogue? I don't think so, because Mantra has a catalogue that features music that differs from mine, even though that music too is outside of the norm. The label believes in my music. No, there's nothing to be astonished about. These people happen to like my music. They're nice people and they want to release my work. I'm quite content with this label. Using non-musical sounds inside a traditionally musical context is one thing. 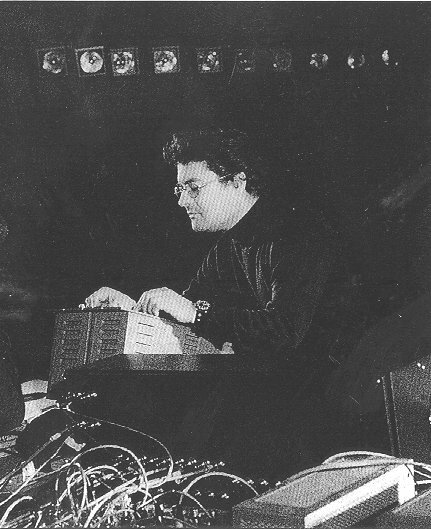 In the 50s (and 60s) we saw electronic composers work with electronic sounds inside a classical musical structure. Do new sounds require, or even lead to new compositional structures? Michel Chion, in his book "L'Art des Sons Fixés" advocates a compositional approach that is different from the classical (notated) manner. Not (only) work according to a preconceived structure and sound-palette but adopting the approach that the material induces as well. That is, improvising in the studio. Working by trial and error. How do you set to work? Do you work like the classical composer, writing things down and then executing them (collect sound material, equipment, record, and edit)? Like you say ... these new structures, the way you say it, that's like putting the horse behind the cart. One of course has to compose with a direction, a lucid idea. One has to have in mind a certain construction, a form. But that form differs according to the theme, to the character of the work and of course according to the material. A work like Le Voyage [a piece based almost entirely on feedback - IS] has a form, another like La Porte another one. And another work that requires a voice or chanting ... every work has its form, but this form is there in the art of creation. I think that from the beginning of my work I have been more original in my form than in my material. Pierre Schaeffer wanted to educate composers (and as a result of that, of course, audiences, too) to find a new way of experiencing music, a sort of "pure listening experience" somehow even coming close to the theories of John Cage. It has become clear, through the years, that you do not see things that way. Although you use sounds 'clean' (with a very clear relationship and association to its source), you use it in such a manner (by encapsulating it in a structure, or combining it with other sounds) that it becomes disassociated from its source, or perhaps becomes an icon, a metaphor. Sometimes this leads towards a solemn, and theatrical atmosphere. What is the function of a sound in your composition? Is it a metaphor? No, but as you already say in your words it is certain ... my work is so varied that there are works where sounds are exposed with their tempered notes like La Noire à Soixante and others which are truly life; the development of sound and its multiplication, its transformation, its mutation, I think that is the better word for it, like in Le Livre de Morts Egyptien. There are sometimes no laws, basically. My sounds are sometimes ideograms. The sounds need to disclose an idea, a symbol ... I often very much like a psychological approach in my work, I want it to be a psychological action, with a dramatic or poetic construction or association of timbre or, in relation to painting, of colour. Sounds are everywhere. They do not have to come from a library, a museum. The grand richness of a sound palette basically determines the atmosphere. At the moment I try to manufacture a certain 'tablature de serie'. I won't talk about it. I almost become a late serialist. After a big vehement expressive period, post-romantic, I think that now I'm going into a period of pure ideas. It all reminds me very much of my work of the 50s. Can you tell something about what sound is, and/or what it means in your work? It is more a phrase. Contemporary digital sound is very realistic, but also very impersonal, it's not a word but an atom, almost virtual. The words together become phrases. These phrases are combined by me. The atmosphere and themes of your work have changed through the years. When we listen to your early work it is noticeable that humour plays a part. This is hardly ever present in the work (that I know) of the last 20 years. I also notice that in the early days you regarded yourself as a man of modern times, who wants to break with the history of music, become a composer with modern means. This unruly, stubborn attitude later on seems less emphatically present. What do think of that yourself? Do you still think one should destroy all music? Well, the things that one says at the age of 20 are, of course, not the same as those one would say at the age of 60 ... I believe that every day one destroys their past. My earlier works are not literally destroyed of course, but when I listen to one after the other they are non-existent now. I don't regard myself as more or less revolutionary now than in the beginning, but now I compose works that are less spontaneous, and more reflective on the things that I see around me, comprising issues of philosophy and metaphysics, radiating a certain serenity which is, I think, a natural thing for an artist. After years of hard work one arrives at a sort of peace and one tries to restrain one's language. Death is an important issue in your work. I think of Le Voyage, Le Livre des Morts Egyptien and Le Livre des Morts Thibetain. Why are you so fascinated with the theme? That's very difficult to say. I think it is the emotional part of my self. I have had many relations who have died. I think that the loss of a friend or a loved one invoke emotions and these emotions are also the emotions that come from tragedies or stories. Death is a great subject for a work. On the other hand I prefer birth, but to me, artistically, I like very much the notion of death, more than birth. I believe that one departs from the end and works towards the beginning. In 1964 you made a prophecy for a newspaper. Fifty years later there would be less other music, but more electronic music. We are now 30 years on the way to 2014. Indeed electronics play an important part in the production of music of these days. What do you think of the developments? I have said that these developments were an inflation of the imagination musically and soundwise because ... I believe that the dressing up of electronics by CD-ROM and all the communications techniques, I think that this adventure will turn back at the music made with a twisted voice ... that's a pity because, for example, people with a fantastic creative mind will be submerged in showbiz. They will be overloaded with synthesizers. I now have strong confidence that we will reach a musical life. You are a film enthusiast. Brigitte Massin once said that in your studio you sometimes write down your composition like a filmscript. Does the notion of "acousmatism" [the musical equivalent of cinematography - Ed.] appeal to you? I can't see the relation between film and the acousmatic. I think that cinema is a way of imagining life, the rhythm, whereas the acousmatic is a way of catching it. One should not confuse a cinema with the film that is projected. When I listen to contemporary electronic and electroacoustic music I see that to many composers one aspect is very important: the use of technology and the meaning it has to the composer. Of course the management of the machine/instrument that one plays is quite important. And composers of electronic or electroacoustic music have the disadvantage of having to learn to play new (and improved?) instruments every month. When listening to many contemporary compositions I hear a composer who is still impressed by his machinery. As a result we hear beautiful sounds that only function as a catalogue of the capabilities of the equipment used. Creative aesthetic statement seems to have become of minor importance. I see that in this regard you stand out from the crowd of composers. Why is it that in your music this pre-occupation with machinery in most cases is absent? And (having asked you about your relation with sound): what is your attitude towards your machinery? That's very simple. I have always had a battle with the machines; not for aesthetic reasons but for reasons of quality. At the beginning of music concrète we worked with discs, but the result of copying a piece of sound was quite poor. So I have always struggled to have the sounds retain their transparency. Now I have conquered these problems, thanks to digital techniques. It is possible to make a perfect copy, but I am worried about the machines doing the work that I should be doing. This is the case with many of the logical catalogues that are available to which one can subscribe. The computer works instead of you. The computer has decided. I think that we now live in a dangerous age because the composer should certainly not work with a tap, that he can open or close. That's a very bad development. I try to work without any specific machinery and when I find a machine ... I find a machine interesting when I have twisted it without knowing. That's same thing like in painting. I love it when the objects have been led away from their function. When working with a filter, and this filter turns a sound into something entirely new and unexpected, that interests me more because I am less connected to the style of the machine and its function than to the source of the sound. The source of a sound interests me because that's the adventure of mind's world. There are particular sounds that interest me because they have been cut in certain fashion, because they have a certain roughness, because perhaps there are these stories that have not been entirely excised. An analogy: Raymond Roussel wrote his books with mirrored images with coded words and I use coded sounds and shallow sounds and sounds that tell a story. And these latter sounds to me are The Sound. The second aspect is a direct consequence of the first one: your music is able to express a clear-cut statement, just because you concentrate on what you want to express. You make quite dramatic statements. Is that caused by a passion for stage presentations? It is not easy. It is a passion for the dramaturgy and also for the psychological problems of this age, the suspense and the curiosity as to where society will go. Music to me is also finding a solution. I am very much interested by the language of sounds and more still to make with the sounds a personal theatre where there are actors who meet and then fight or embrace. It's an emotion, but ... it's me who steers them and they stem from myself. They do not necessarily have to be emotional. They exist. The electronic/electroacoustic composer is often a lonely man, sitting behind his desk with his tools. In your case, most of the photographs I have seen picture you in a live situation. You did some large scale live performances. Were these the consequence of your popularity in the 60s and 70s? Did you attract a large and broad audience? Well, I wanted an audience that was adapted to a certain condition. I wanted a concert that was made theatrical by decoration, light, glass, sounds. Certainly also by the spatialisation of the sounds that were made audible. These concerts were given in boxing venues, churches and concert halls. I certainly had a long period of well-attended concerts but now it is different because the audience now has the radio and the discs. Nowadays many people hear music at home. Electronic music has certainly drawn back inside the cocoon of the living room. Many of your works have been designed for stage performance. How do you feel about this situation? Why is stage performance so important to you? The concert is an artistic performance. A concert work must be re-recorded and re-edited for home listening. When I make a version for home, this version is aimed at a close listening, but it must be more profound and richer. Both situations and both versions are interesting. Practically all my important works have been released on disc but only the future will tell what will happen in the area of concerts. Henry was almost the opposite of Pierre Schaeffer, the godfather of musique concrète. Schaeffer was a thinker, a theoretician, and not a musician. Schaeffer was interested in concrete sounds from a theoretical point of view. Henry on the other hand was a trained composer, and most of all audacious, ready to set about things. Concrete sounds were interesting to him as a means for composing music. The two Frenchmen had in common their curiosity and a maniacal search for order. But whereas Schaeffer got stuck in ordering his thoughts about sound and instrumentation, in search for a totally experience of music, Henry in 1958 left the Paris institute to set up his private studio, where he could work with his sounds without being bothered by bureaucratic rules and regulations. Pierre Henry was born in Paris in 1927. He never went to school; his teachers came to his house. Being of feeble health he had to do gymnastic excercises and perhaps that is the reason that he developed a strong feeling for rhythm. In 1944 he studied at the conservatory; piano and percussion with Passeronne, composition with Nadia Boulanger and harmony with Olivier Messiaen. Henry is an ardent film lover and visits the cinema two or three times a week. "Le Ballet Mecanique" by Fernand Leger is a great inspiration because of the direct link between sound and vision. In 1949 he received a commission to write music for a television documentary called "Seeing the Invisible". He then started working with the 'disque souple', the writable record. The tape recorder was not yet available in a practical model. He by then had already made acquaintance with Pierre Schaeffer and with the music of Luigi Russolo, John Cage, Walter Ruttmann etc. When Schaeffer asked Henry, because of his skills as a percussionist and at the piano, to assist him with the Symphonie pour un Homme Seul in 1950, the career as a composer of musique concrète or, better, electroacoustic music has taken a lift-off. The early electroacoustic compositions, dating from 1950, show Henry dabbling about with sounds recorded with the disque souple recorder, much in the same vein as Schaeffer. The structure, however, is much more complicated. Whereas Schaeffer keeps to simple classical and rhythmical structures, Henry shows much more insight into complex composition. In 1964 Henry produced his Jerks Electronique with a 'song' called Psyche Rock under the pseudonym Yper Sound. It sold some 150,000 copies. It made Henry instantly famous, not only with connoisseurs of avant garde art but also with the man in the street. A few years ago its echo was to be heard in the background of a house music record. Anyway, it enabled Henry to make a good deal with the Philips label. Although always following his own path, Henry has never been a solitary closed man. His friendship with dancer Maurice Bejart has taken him all over the world. Henry has produced music for films and advertisements. Another difference between Schaeffer (and the disciples of his theories) and Henry was that Henry did not follow the Husserlian ideas about music. To Henry sound has never been interesting as a phenomenon as such. That's why he denies the existence of noise; there is only sound. The sound that is there for music. To Henry, emotion, he calls it nature, is to be captured in music. That's a fundamental step over the line that Schaeffer had drawn. Towards the end of the 70s the public attention died down, but Henry continued to develop his music. Through the years Henry's work has gradually changed from spikey, and sometimes even anarchistic (certainly for the well-behaved musical society of the 50s) towards themes that are more sincere and more reflective. Perhaps it is because of these themes, not fit for a society that welcomes the energy and ideas of punk-rock and anarchy, that Henry has remained more in the background. In 1989 however, the WDR broadcast a radio-play in three episodes, each lasting 180 minutes, on Proust's "A La Recherche...". In 1990 a new work was released: Le Livre des Morts Egyptien. Henry has been invited to perform the work on several occasions around the world. Let us listen to Henry's music from a cool distance. Henry's works have in the past been released on vinyl by Philips, all of which have been long deleted. Much to my regret because what I did know of his work I have been able to purchase at fleamarkets. But sound quality was poor of course. Philips only rereleased the Variations pour Une Porte et Un Soupir on CD a couple of years ago. Now French label Mantra has rereleased a series of works by Henry. I was amazed to see this because the Mantra catalogue for the most part features New Age, Krautrock and hippy music. Henry however doesn't seem to be worried by this marketing anomaly. So why should we? The quality of the releases is excellent. This trio surveys the early works of Henry when he still worked with Pierre Schaeffer. As with many creative people the early work in hindsight reveals the core of the later work. The core of Henry's work are the piano (snares) and percussion. They are abundantly present on these three discs. The later solemnity of the work of Henry is completely absent in these works. Humour plays a part (Vocalises), and we hear comments on jazz music (Tabou Clairon). Now and again there is a wildness and freakiness that Nurse With Wound could only dream of (the hilarious Kesquidi, something like a Marx Bros film on tape). A time warp and arriving in 1967 brings us to Liverpool, with its monstrous concrete cathedral. Henry had been asked to compose music for the inaugurational mass. Henry by that time already wore the aura of being a composer with a deep affection for public performances of a mass-like character. Messe de Liverpool is structured as a classical Catholic mass. Starting with a Kyrie, moving on with Gloria, Sanctus, Agnus Dei, and finishing with Communion. The work consists of recitation of the traditional texts in a way that is definitely Buddhist. These voices are supported by traditional musical instruments that are traditionally played at first but after some ten minutes they are played in a typically Henry-esque fashion: plucking and scratching the snares. Pierres Reflechies, composed in 1982, bears all the characteristics of the contemporary Henry: ostinatos of a certain number of instruments that are placed, superimposed over each other in thousands of combinations that differ only slightly. This description makes one think of minimal music. But this is much more anarchistic, more undisciplined. Here the ideograms that Henry speaks of in the interview are applied. Some parts reminded me very much of the Cristal-Memoires radio-play that he composed for the German radio (which is to my opinion, next to the Apocalypse is the best he ever did). In this composition Proust's work is translated in sound, which of course has all to do with ideogrammes and synaesthesia. Pierres Reflechies is dedicated to the late Pierre Schaeffer. This work is dedicated to a close friend of Henry: Maurice Bejart, the famous dancer. Henry has composed numerous works for ballet, which were staged by the dancers of Bejart. In the early days Henry even accompanied the dance group all over the world. This work is exactly what the title says: it's a study of movement and rhythm. Starting of with very simple beats that meet with the reversed sound of scraped metal wires. Track 2 is a play for blowing balloons and a person saying: 'pssh' and 'psst'. Talking about humour. Track 3 is instrumental and quite acoustic whereas track 4 is entirely electronic. And that's how it continues. The whole things consists of 21 etudes for a ballet dancer. This is Henry's masterpiece. Actually there is nothing much to say about the composition when one decides not to dissect the work in exegesis. The apocalypse, spooky already in the literary form, is performed in a fashion that makes the hair on your back stand up. Henry's translation of the different scenes, using no doubt the ideograms, is more than perfect and the narration that accompanies the auditive scenery brings shivers down your spine. When your French is below average I advise you to read along with the music in your own language. Try to find a Bible somewhere. John's apocalypse inspired Clive Barker too, you know. Death is an important theme in Henry's work. The Egytian book of the Dead therefore is an ideal theme for Henry to work on. The ideograms that are essential in this composition are magnificently worked out. The course that the sounds take is quite dramatic and theatrical. The introduction is awe-inspiring. Henry follows in the subsequent scenes quite exactly the course that the dead person will go when on his/her trip towards the realm of the dead. The associations with large pyramids and ancient Egypt are but one layer in this 'spectacle'. Based on the film by Dziga Vertov. Here again Henry's love for the filmic genre is shown. Actually this work should not be listened to without seeing the images. The titles give a clue about the scenery but that's hardly enough. Indeed, we can hear Henry go back to what he calls the pure composition that he favoured in his early works. In this soundtrack the large and dramatic movements are absent. The music is as machine-like as the film is. It tries to abstract the concrete. The majority of these recordings are available in the UK from Ultima Thule, 1 Conduit St., Leicester LE2 0JN; or via distributors such as Harmonia Mundi. This interview was made possible thanks to Jerome Noetinger of Metamkine. For those who would like to read more on the life of Pierre Henry, Michel Chion wrote a biography in 1980, published by Fayard in Paris, and available from Metamkine, 13 rue de la Drague, 38600 Fontaine, France. The interview and text are by and © Ios Smolders, and originally appeared in issue 44 of Vital magazine, in 1995. This version has been slightly edited by Brian Duguid; some quotes by Ios, Henry and Michel Chion have been altered to make them read better in English.